I’ve never done this before. Caressed a globe, I mean. We’ve had a globe in our house for a long time, purchased in the days before maps were finger-tip accessible on the computer, when we had young students in the house who needed to see where countries in the news or homework were. But holding it in my lap? No. That, however, is what the Lenten Prayer Guide I’m following asked me to do this week: Settle into your comfortable place with a map of the world or a globe. Hold [it] in your hands as you breathe deeply. The exercise goes with the text, John 3:14-21, with the well-known Yes, God loved the world so much that he gave his only Son. Our globe has relief features on it, so what I felt first were the “bumps” — the mountains, the Himalayas the highest of course, and varying heights around the ball. After that I let my mind go where it would as I moved my hands and eyes around the various continents, from my home in the center of Canada, then to the U.S., finding Virginia, where I’m reading at a Mennonite/s Writing conference at the end of this month, on to South America, to Paraguay, the place my husband was born and grew up, which was especially on my mind since we attended the launch of a delightful children’s book this week featuring that country (David’s Trip to Paraguay), over to the former Soviet Union, with so many connections, for it’s the land my grandparents, both paternal and maternal fled. And on to Africa, the Middle East, thinking of Egypt and Syria and their prominent place in the news…. Yes, moving around, thinking many more thoughts in short order than one can write in short order. Please understand that I was not trying to imagine myself into some God-like view of things. This felt to me a very human exercise, just a twelve-inch diameter ball of representation on my lap, there in my hammock chair on the sunny side of the house, and if it reminded me of anything, it was how limited and essentially self-referential my knowing the world is. I can grasp the concept intellectually and believe it. But I don’t have a God-like view of anything. 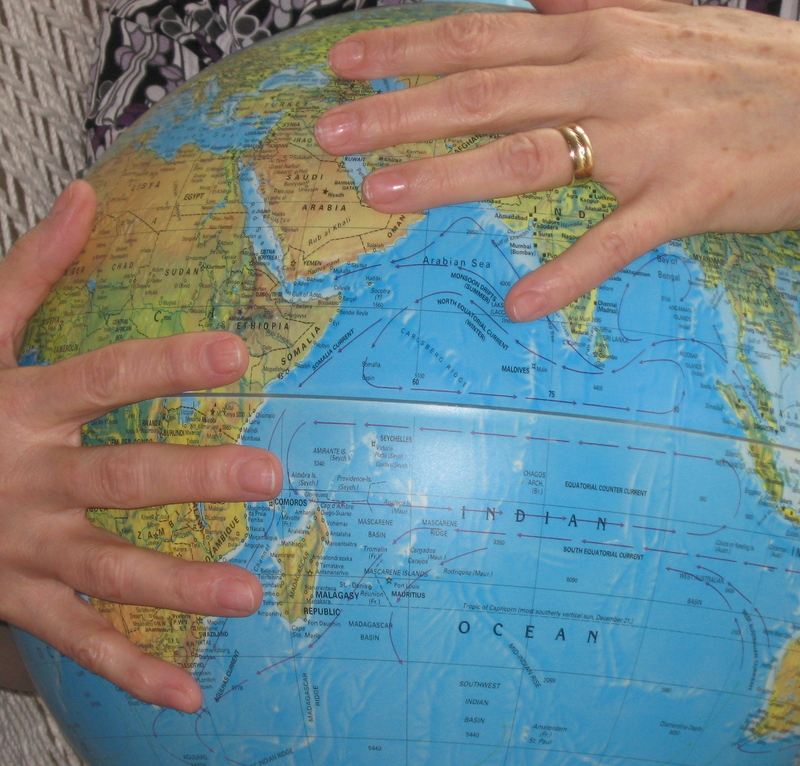 Holding the globe was a re-alignment for me, a gesture of both futility and humility. Knowing how quickly I lose proportion around world, but knowing too that I’ve never really had it. God so loved the world. As I reflected then on the familiar John 3 text, I saw that Jesus’ teaching about world, light and dark, salvation and condemnation, is also large, but I wondered if we don’t do the passage a disservice when we use it in some overarching way that presses these truths over others instead of as an invitation in. When we lift it out of the intense, provocative, startling one-on-one conversation Jesus has with Nicodemus, a religious man who needed to see who Jesus was and where he was, and join him there. Jesus forecasts his death, and he uses birth, wind, light and dark, and also world in this conversation, to coax and stretch the other man. It’s enigmatic, personal, and Other-ing all at once. It’s a conversation at night in which Nicodemus is challenged to “come out” into the light. It’s a big teaching, a big story, but I can’t really grasp it outside that one-on-one conversation, any more than I can pretend to know the world by running my hands over a globe. The text asks me to sit down in the shadows behind these men, hidden and womb-like, hearing the teacher’s words and also the wind in the trees. This entry was posted in Personal, spirituality and tagged globe, John 3:16, Nicodemus by doradueck. Bookmark the permalink. “. . . and also the wind in the trees.” I love that!